Lock in a great price for Sophia Luxury Suites – rated 9 by recent guests! Sunset view on our private terrace was spectacular. The staff at Sophia Suites is the BEST!!! I've worked at hotels and in the hospitality industry for many years... they are phenomenal! The rooms are nice, gorgeous views. I'd stay here again simply for the staff's service! Thank you! 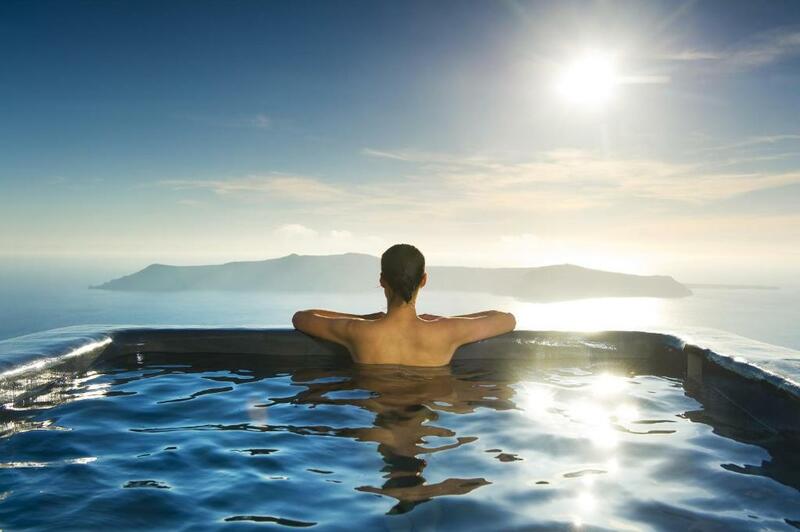 Having a private pool overlooking the caldera. Daily sumptuous breakfast from the balcony. Helpful and very friendly staff. Would have love that complimentary pink champagne that never came! We loved the view, the plunge pool, and the cave suite itself. The breakfast in the room every morning was phenomenal. Our favorite night was the night we watched the sunset from our room/pool with wine in hand. Everything was amazing. Great location. Amazing staff , Katerina she is an angel. A view that you will never forget. Great breakfast. Great location. Very good wifi. Cannot complain for anything. Great location. Lots of walking involved to get to and from these cave suites. Once you’re there the views are amazing. Private pool was amazing. Restaurant had good food. Location is close to oia without all the congestion. Very nice room, very well decorated, great breakfast, gorgeous caldera’s view and the best staff/service ever! You can ask Vivian’s help and she will make it happen. The hotel was absolutely stunning! The location was perfect and the view was breathtaking. One of our top picks in Imerovigli.At a distance of 1,148 feet above the caldera, Sophia Suites is located in Imerovigli and built with respect to the local architecture. It features tastefully decorated accommodations with hot tub and free WiFi access, while traditional Greek breakfast a la carte is prepared daily. Each room, junior suite and suite of Sophia will provide you with air conditioning, flat-screen TV and a designer's fridge. The private bathroom also comes with shower and branded toiletries, while some include a spa bath. Extras include a safety deposit box, a laptop safe and bed linen. At Sophia Suites you will find a 24-hour front desk. Other facilities offered at the property include a ticket service, a tour desk and luggage storage. The property offers free parking. The hotel is 650 feet from Skaros. Santorini Airport is 3.7 mi away. When would you like to stay at Sophia Luxury Suites? Offering an outdoor plunge pool, this air-conditioned room features Aegean Sea views. It has a flat-screen, satellite TV and a designer's fridge. Free WiFi is provided. Please note that the private terrace is part of a bigger communal terrace. Also, the private plunge pool does not offer privacy. Offering an outdoor plunge pool, this air-conditioned junior suite opens to a private terrace with Aegean Sea views. It features a flat-screen, satellite TV and a mini-bar. Free WiFi is provided. Please note that the cave suites of this type offer unique and different decors and layouts. Some units are split level. The private pool can be either covered, semi-covered or fully open. The plunge pool is temperature controlled at approximately 30°C. Please note that the temperature may vary on extreme weather conditions. Offering an outdoor plunge pool, this air-conditioned suite opens to a patio or yard with Aegean Sea views. It features a separate living room with 2 flat-screen, satellite TVs and a fridge. Free WiFi is provided. The hotel has 2 suites of this type and any of them can be allocated as it depends on the availability upon arrival. Please note that the cave suites of this type offer unique and different decors and layouts. Offering an indoor plunge cave pool and a spa bath, this air-conditioned suite features a separate living room with flat-screen, satellite TV and a fridge. Free WiFi is provided. Please note that the cave suites of this type offer unique and different decors and layouts, subject to availability upon arrival. Offering an outdoor plunge pool, this air-conditioned suite opens to a balcony with Aegean Sea views, it features a seating area with view, a flat-screen, satellite TV and a fridge. Free WiFi is provided. Sophia Honeymoon Suites have a spacious terrace and a comfortable lounge area. They offer bathrobes and slippers, luxurious amenities, rain shower, safe, air conditioning, WiFi, TV, an interior plunge pool and an outdoor plunge pool with breathtaking view of the Caldera and the Aegean Sea. Please note that the terrace is private, however it is not have any walls or partitions as this would block the panoramic view to the caldera. Featuring an indoor plunge pool, this room includes a satellite TV, electric kettle and air conditioning. Please note that this room is located on the main walking path and has no private terrace. Featuring an indoor cave pool and an outdoor plunge pool, this suite includes a satellite TV and i-pod docking station. Featuring a spacious, indoor cave pool and an outdoor plunge pool with views of the Caldera and sunset, this honeymoon opens to a spacious terrace. A brand new 'luxury-living" hotel, at the highest point of the Caldera cliffs, offering mesmerizing sunset views and luxury "barefoot" atmosphere. Personalized services and tailor-made recommendations and services. Nothing is too much! Feel Free! House Rules Sophia Luxury Suites takes special requests – add in the next step! Sophia Luxury Suites accepts these cards and reserves the right to temporarily hold an amount prior to arrival. Please inform Sophia Luxury Suites of your expected arrival time in advance. You can use the Special Requests box when booking, or contact the property directly using the contact details in your confirmation. Highly recommended Sophia Luxury Suites to everyone. It's very rare for me to give a hotel a high rating as I have very high expectations but this place definitely exceeded my expectation from the staff, the view, the rooms (we stayed in two different type of rooms and they were both absolutely amazing in different ways). When we arrived, a staff member came up the stairs to meet us and carried all of our 4 suitcases on his shoulder which already blown us away. When we arrived to our room and saw the stunning view, we were so delighted. But that was not all, our rooms were so so nice, we stayed at the honeymoon suites which have an indoor heated swimming pool and the aurora suite which also has an indoor heated swimming pool. It was ideal as it was a bit cold when we were in Santorini. The staffs were extremely friendly and helpful. They went out of their way to making sure we feel like we're staying with our family and that any requests can be made. We had airport transfer at 4am and they even prepared breakfast for us at 3:40am as I requested. This place has blown us away and when we visit Santorini again we would definitely stay here. The staff and the location of this hotel are just perfect. Amazing view on the castle. The hotel is located in a very good place very closed to Firá by walk. Special thanks to the staff who speaks french which was very appreciable. the service is very enthusiastic. they also upgraded our room thus we spent a really nice holiday. The service and breakfast were very good. So were the help with car rental. Everything, the location, view and the suite. Exceptional room service menu (chef Evi is extraordinary), wonderful service staff, perfect location. Beautiful and clean facilities, freiendly staff and good breakfast. And also, the location is nice and quiet. Everything was perfect! the location, the views, the private jacuzzi, the suite itself, the breakfast and the dining options and the staff! we absolutely loved it! Not one bad thing to say.